Honda CB450, CL450 Scrambler & CB500T vintage motorcycle parts, offered by Common Motor Collective. Designed for 1965-1976 Honda 450cc & 500cc twin motorcycles. The parts in the categories below are designed to fit the two cylinder (twin) dual overhead cam (DOHC) Honda 450cc & 500cc family of motorcycles produced from 1965-1976. This includes the K0-K7 variants of the CB450 (Black Bomber / Hellcat) and CL450 (Scrambler), as well as the CB500T. 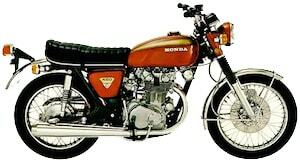 Our Honda CB450 / CL450 / CB500T FAQ answers many commonly asked questions about these bike models.